Not only are nettles incredibly nutrient rich, especially in iron, selenium, niacin, zinc, and the nerve feeding, muscle relaxing trifecta of calcium/magnesium/potassium, but they also contain a wealth of cancer preventive antioxidants such as kaempherol, and antihistamine, anti-asthmatic, vasodilator, and anti-inflammatory properties of the cinnamic acid, scopoletin, ascorbic acid, chlorogenic acid, and adenosine. Nettle pesto can be eaten by the spoonful for quick energy, and for fast sinus congestion relief. 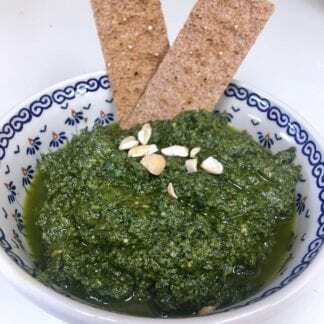 Whenever my sinuses are acting up due to weather, living in the city, dust in the house, I take a container of nettle pesto out of the freezer, defrost it in cool water, and eat a couple of spoonfuls as is. Works a charm every time and I get the added bonus of extra energy! Mentioning antioxidants ~ many antioxidants are damaged to destroyed with high heat and drying. Many nettle pesto recipes call for blanching the nettles first to “remove the sting.” Please don’t do that. 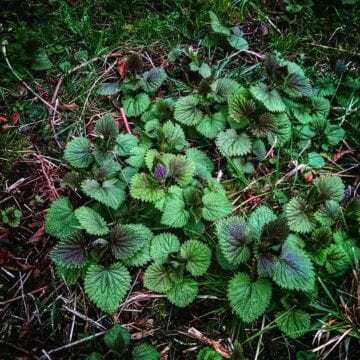 The acids in the hollow hairs that cause the sting of nettles are completely neutralized with the food processor. Think about it: the acids in nettles are the plant’s response to being just so tasty. Wait. Whuuuut?! The will to survive and thrive is not just an animal/human instinct. The plants want to have a full life as well! 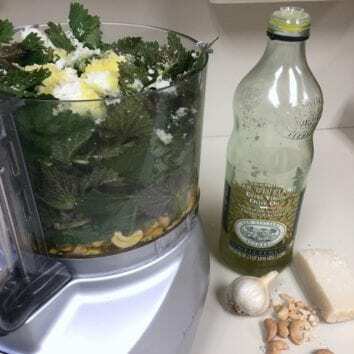 Inside nettles is the very antidote to the acid – alkaline! The best first aid thing to do when stung by nettles is to take a couple leaves, rub them between your thumb and forefinger until super juicy, and apply to the sting. Voila! 1 cup nuts of your choice – almonds, pine nuts, walnuts, macadamias, pecans, cashews, etc. Put all ingredients in a food processor and process on high until creamy, making sure all the nettles are completely incorporated. That’s it! Can it get any easier? I don’t think so. What an incredibly fantastic taste! Not only is it good on the traditional pasta, but the pesto makes a wonderful spread on toast or crackers, on baked potatoes, on a BLT, on pizza – the choices are endless. Bring it to your next potluck; you’ll be super impressive and your social anxiety will disappear. It’s that good! Nettle pesto freezes well, and keeps for up to a year! Zippy! Incidentally, you can use any edible wild greens to make pesto. Think dandelion greens, chickweed, wild mustard.